I want all my word document files to be converted as pdf files, How to do it? is that possible to do in windows? Can you tell me the steps to do it? Re: How to convert the word file to pdf file? Is it possible to do it? How to do it? To downlaod doPdf software from internet CLICK HERE!! STEP 1: After the setup gets downloaded, install the software in your Windows system. STEP 2: Now open the word document which you want to convert into pdf format and select File -> Print. STEP 3: In the printer name option you can find a new option added “doPdf v7” select it and set the page format which you want and Click Ok. STEP 4: The next window will ask for the destination to save the pdf file, give the desired destination which you want and select Ok.
Once the conversion is done the changed pdf file will be opened automatically for your view. Yes, U can convert word document to PDF using Nitro pdf converter .. after installing, a tab will be appeared "Nitro" in the menu bar. By selecting that tab, automatically the document will be converted to pdf format. you can also do it online on google documents. just go to google documents and browse your word files there and then convert it into pdf files. To covert word file to pdf file using pdf to word converter softwere. it is possible to convert to all word file in to pdf files in the softwere using . Its possible to convert the word file to pdf.These steps will help you. Yes it is possible to convert Word file to PDF file..
1.Launch Libreoffice or openoffice.org, click the "Open Button",navigate to your MS word document and open it. 2.Go to "File", and then "Export as PDF". 3.Review the options on the PDF options dialog that appears.You usually do not have to change anything unless you have special requirements, in which case options should be self Expantory.To proceed with the conversion just click "Export", select the location to save the new PDF file to, and "Save". 3.In the print window,click the PDF button at the bottom left then select the "Save as PDF" option. 4.Choose the location, rename the PDF file , then click save.. There are lot of softwares are available on Internet for Word to Pdf conversion. One of the is "Bullzip Printer ". It not convert word in to pdf , but any type of document either it is web page or image file or whatever . Another feature is, you can merge pdf's in any order. After you have installed software, you just need to press "Ctrl + P". It works similar to printer & prints whatever document you have opened in your current window. Yes, it is possible to convert the word files to pdf files. After download this software install it and convert the word files to pdf files. You dont have to install the Third party softwares to covert the word files into pdf. There is a option available in the Microsoft Word Itself. If you are using MS Office 2007/10 just Go to Menu --> Drop down to Save as --> Choose save as PDF. It will save the Word file into PDF. If you dont have the Option available in your MS Office version then Download the Add-on from Microsoft Website. I have provided the Link. Yes ; It Is Possible To Convert A Word File To P.D.F File . . . ..
You Can Do That Online Also Just Go To http://www.freepdfconvert.com/ And Upload Your File and the Output Will Be Given Out . . There Are Software's Where You Can Download Them & convert . . .
Word To PDF Converter 4.0 . . . Yes you can Covert a Word File to Pdf File. First open this website which provides free conversion of Word to PDF. After opening the website as mentioned above you will find an option at the left as TRY FREE ONLINE. Below that option you find a Choose file option using witch you need to upload the Word file which you need to convert. After Uploading the file you need to covert you will be redirected to the website. The next step you need to do i giving your Email Address . The reason for giving Email Address is ,the website converts the file online and sends it to your Email address. Hardly it will take 5min to Deliver the converted file to your Mail Id. To convert Word to PDF follow the below step`s. First you need to download the PDF converter software. After downloading the Software you need to install the software. After installing the Software you need to select the file you need to covert . You can get the converted file at the Path which you have set. That`s it the conversion of Word to PDF is easy , so select the procedure which you want and covert your files . You can use the Adobe Acrobat Pdf Reader and marker 9.0. To convert and to read the PDF files , this is a third party software which helps to read the PDF files and to convert the normal file in PDF formate. All the best. You use converter software such as word to pdf (word2pdf)..
You can then save the PDF or Word document on your computer.You can also convert Powerpoint and Excel to PDF. PowerPoint files can also be converted to Flash.All MS Office versions are supported, including Office 2007/2010. U need to install save as pdf software from microsoft website download and istall it. Click the "Office" icon button in the top-left corner of your desktop. 2.Scroll down and click "Save As" and then click "PDF." Type a name for the file in the "File Name" field. 4.Click "PDF" in the "Save as type" field. Put a check mark in the box next to "Open file after publishing" if that is what you desire. 5.Choose "Standard" or "Minimum size" in the "Optimize for" section. Standard allows you to print at a high quality. Minimum size is for online publishing. 1. if you have ms office 2010 then, you can easily convert it by file menu , as to save as pdf. 1. Go to the Applications menu and launch openoffice.org. 2. Open the required word document in openoffice.org. 3. In the file menu, click on "Export as PDF". 4. Click ‘export’ in the window that appears and select the desired location to “save” the pdf file. 3 you can also use pdf creater for this. 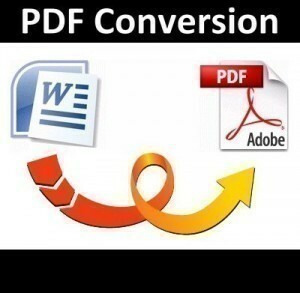 You can convert a word file to a pdf file by using a converter tool. Conversion the word file to PDf file : Conversion of Microsoft word file to PDF file is not much easier and converting the editing file you have to click on save button in the MS word file. 1) Firstly you have to drag a word file and convert them into file list. 2) After that you have to click the Convert to PDF file . 3) Then click on Save as button. Yes,is it possible to convert the word file to pdf file and for that you have to install download PDF file converter software.Then insert word file in PDF Converter and click on OK .Now you have successfully converted word file into PDF File. There is so much software by means of which it can convert |word| file in the |pdf| file. To unload the doPdf software of Internet. It has a connection on Internet of work. STEP 1: After the disposition it gets unloading, install the software in your Windows system. STEP 2: Now the word document open that wants to convert in the |pdf| format and chooses the file- the printing. STEP 3: In the option of name of printer you can find a new "doPdf v7" addition option choose it and puts the format of page that wants and clicks on approval. STEP 4: The next window will ask for the destiny to save the |pdf| file, give to the desired destiny that wants you and chooses approval. One time the conversion is done the exchanged |pdf| file it will be open in an automatic way for your view. So this was the procedure to convert a |word| file in the |pdf| file. 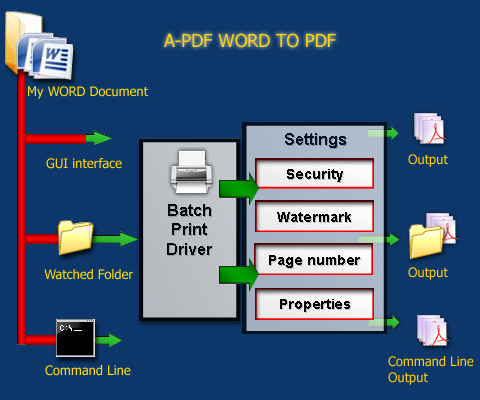 Yes it is possible to convert the word file in to the pdf file by installing the software of word to pdf converter in the system and also it is very much useful when it is to be done and also the software is to be downloaded from the internet and installed in the computer so that you can download the files and convert the word files in to the pdf files. Off course, you can convert the word files to pdf files. Now install PostScript printer driver and Tap on Start->Settings->Printer and select Add printer. Choose Local printer and it should be a file. Now install Ghostscript and GSview. Open Word document,hit on File->Print,select postscript printer and click ok. It will ask you file name,giva name with.ps extension. Launch GSview and open the ps file you saved. Tab File->convert,select pdfwrite and click ok. It will ask you file name,give the name with .pdg extension. You can do this is MS Word 2007 or newer version. Just open and save as pdf in ms word. Just One Click your Format is Ready. You can easily convert your word file to pdf file. Different software on the internet are available. Also, you can convert your file online as well. STEP 1: Download Word to PDF Software and Install it. STEP 2: Open the Word and add content in it. STEP 3: Go To the File Menu and Click "Save As". It shows Options in which "Pdf" is one of the Option. STEP 4: Select the Pdf. Download Word to Pdf Here. You can easily convert word to pdf with the help of third party software . Yes it is possible.You can change it. FOLLOW THE SIMPLE STEPS TO CONVERT WORD FILE INTO PDF. 1)Go to Microsoft’s official download page and download ‘Microsoft Save as PDF or XPS’ add-in from there. 3)After installation open the document you want to save as PDF.Now from the ‘Quick access toolbar’ at the top right corner select the customize option. Select the ‘More commands’ option and add ‘save as other formats’. Now you’ll see the ‘Save as’ button on the quick access toolbar and you can use it to save your file as PDF quickly and easily or just use the keyboard shortcut F12 key to open the ‘Save As’ dialogue box and change the file format to PDF. Thats it your job is done ..
you can convert word file to pdf in a whisker but you require a converter software for that. there are a whole lot of third party converter programmes available such as doPdf,Nitro Pdf which can assist in conversion.you can also convert word document to pdf using online option such as google document.the installation process of these softwares and their usage procedure are varied and can be followed without much hassle. this is not a big problem ..you have to download only a single software Microsoft Office 2010 or above.. Yes, its possible to convert the word file to pdf.Thd following steps will help you. first downlaod doPdf software from internet-----> install the software-----> open the word document which you want to convert into pdf format -----> Print ----> In the printer find a new option added “doPdf v7” select it and set the page format which you want ---> Click Ok---> save the pdf file, give the desired destination which you want ----> select Ok.
once the above steps done you will find the word file converted to pdf file. Yes it is possible to convert word file into PDF file..Just fallow the steps given below. -->You need to download the PDF convertor. -->Then select the word file which you want to convert. -->Before that you need to install the software. -->Then select the option "DOPDFv7" and set the page which you want. -->Then click 'OK'.Then save the PDF file which that has converted. this software is free available to the internet and download it..
For converting First of all download one Converter.. This Software is download from internet.. From Microsoft Blog..
And Chose file and Convert..
Then use and Convert it..